The IISD Experimental Lakes Area has a long and proud history of providing a unique learning environment for undergraduate and graduate students who have worked on projects and conducted independent research at the facility. Hundreds of students have conducted research at IISD-ELA, learning strong scientific principles, field techniques and integrated approaches to understanding global freshwater issues. 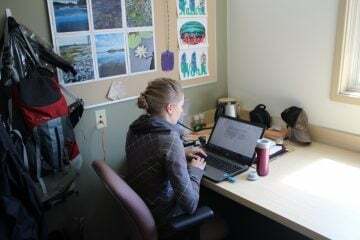 University student research is welcomed as part of our broader research goals, and students will be given the unique opportunity to connect with the scientific community, examining multiple levels of ecosystem dynamics as well as the broader policy implications for these boreal systems. If you are interested in undergraduate or graduate research at IISD-ELA, we have several team members that are adjunct professors at various educational institutes in Canada. Link to their bios below for more information on their research backgrounds. For general inquiries regarding graduate research at IISD-ELA please contact Vince Palace, Head Research Scientist at vpalace@iisd-ela.org.